This nautical-inspired decorative painting was intended as a colorful focus for the kitchen area. I decided to treat all the cabinet doors as one mural, rather than creating a separate vignette on each panel. It was a challenge to create an image that could break into sections yet remain as an uninterrupted design. 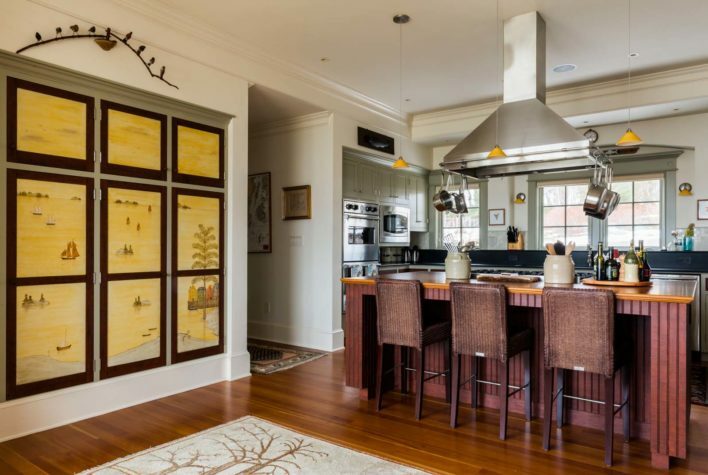 In the kitchen, the windows look out toward the open waters and islands of Penobscot Bay, so it was important to me to create a mural that incorporates the environment and continues the nautical theme. I chose an earthy palette, using yellow ochre to represent the ocean and sky. In this room, where heather green and white are predominant, the yellow ochre contributes to the space rather than overwhelming it. The softness of the mural allows other colors to play off it as accents. The yellow ochre background is easy to live with, and it’s unique and distinctive, while offering a touch of sophistication as well. The mural is simplistic in style, but balanced. The weight of the piers on the far left and right frame the design, allowing me to treat the middle panels with fewer details. On their own, the middle panels might seem sparse, but in a bank of many doors, they become graceful, balancing out the weight of the sides. After I painted the mural, my husband fauxgrained the cabinet door frames as well as the island base and drawer fronts throughout the rest of the kitchen, tying the room together. We also designed two four-foot-square compass roses on the floors of two adjacent rooms and fauxgrained the drawer fronts in those rooms to further complement the kitchen. On two major staircases, we painted compass roses on each of the risers, echoing the nautical elements in the kitchen. Nautical themes have a personal draw for me, since my husband and I are avid sailors and spent about six years living on a boat while still painting. We’ve been in the decorative painting business for 36 years. Over that time, as tastes have changed, we’ve taken basic decorating techniques and adapted them for any style, in any palette. Because we use oil paints and glazes for all our work, it’s going to last indefinitely, regardless of trends. In this particular house, I appreciate the serenity of these scenes. Every little boat, tree, and element has the faintest shadow against the stillness of the water. To me, it’s restful, happy, and calming. And timeless, too.